Serbian and Croatian officials have joined together to celebrate the 150th anniversary of the birth of electricity pioneer and inventor Nikola Tesla. Tesla, an ethnic Serb, was one of the pioneers of modern electrical engineering, and is recognised as one of the world's greatest inventors. Several hundred officials attended the ceremony in Smiljan village in Croatia. Among them were the Croatian President Stjepan Mesic and his Serbian counterpart, Boris Tadic. The Croatian premier, Ivo Sanader, also attended the ceremony along with the US ambassador to Croatia, Robert Anthony Bradke. "I am happy that we are here today to celebrate Tesla, a Serb, a son of Croatia and a citizen of the world," President Mesic said at a ceremony close to the house where the inventor was born. A pioneer in the days when electricity was changing everyday life, Nikola Tesla patented more than 700 inventions including wireless communication, remote control and fluorescent lighting. His most famous work formed the basis of the modern alternating current (AC) electrical power system, which is used across the world. 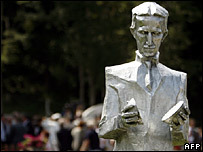 Most of the speeches emphasised the fact that Tesla symbolized Croatia's and Serbia's shared past before the breakup of the former Yugoslavia in the 1990s. "There were not many individuals from this region who reached the top by their vision and ideas, but those who did are our joint treasure," the Serbian president said in his address. "Both Serbia and Croatia had many great moments in history, as well as great men who marked our joint past." The scientist once famously stated that he was equally proud of his Serb origin and Croatian homeland. Officials opened a Tesla memorial complex, including a museum inside his restored childhood home. Tesla moved to the United States at the age of 28 where he carried out the majority of his inventions. Despite his success, he died penniless in New York at the age of 86.